The Carico Lake Turquoise is located South of Battle Mountain in Lander County, Nevada USA. 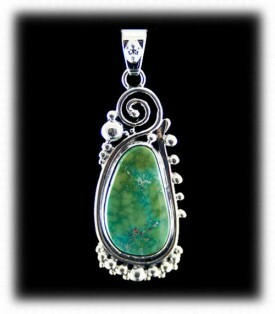 This Turquoise Mine produces Turquoise in multiple shades of blues to beautiful greens. Carico Lake Turquoise has become very popular and highly collectible in recent years for its beautiful shades of a spring colored lime green running through a sea of light sky blue with golden brown spiderweb matrix. The Carico Lake Turquoise Mine got its name from its unique location, in ancient years there was a lake that has since dried, hence "Carico Lake." Mining is very limited these days which makes the supply of this material limited. Due to the great demand for Carico Lake Turquoise, it has become one of the most valuable types of American Turquoise and the investment value of this Turquoise is great. To the left is a beautiful Carico Lake Turquoise Ring in 14k Gold and Sterling Silver, created by John Hartman of Durango Silver Company. This Turquoise Ring features a great example of what is referred to as Spring Green into sky blue Carico Lake Turquoise. This quality of Carico Lake Turquoise is desirable by many and is limited to find for sale as is any lime green Turquoise. 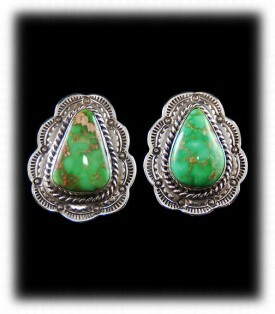 This is a great example of highend Carico Lake Turquoise Jewelry. To the right is a 14k Gold Ring featuring a lime green Carico Lake Turquoise stone with water webbing running through the gemstone. This is another coloration of Carico Lake Turquoise that is in high demand. 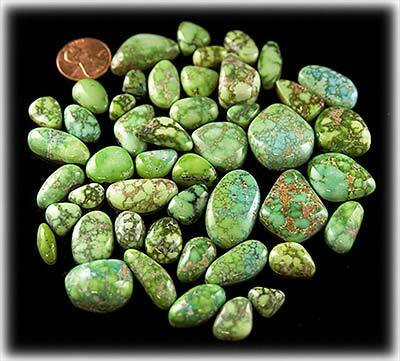 Lime green Nevada Turquoise is scarce and Turquoise collectors hunt for lime green Carico Lake Turquoise. This ring was made by Native American artist Will Denetdale. To the left is a fabulous Sterling Silver Bracelet inlaid with high quality Carico Lake Turquoise in lime green, handcrafted by Navajo Native American artist Phil Loretto. This is a heavy Silver Mans Bracelet that is very sleek and attractive when worn. The Carico Lake Turquoise that it is inlaid with makes this a unusual and one-of-a-kind piece of Carico Lake Turquoise Jewelry. To the right is a Navajo Row Bracelet made with Spiderweb Carico Lake Turquoise in a medium green coloration. It features five Carico Lake Turquoise gemstones with reddish brown spiderwebbing running through the stones. Spider webbed Carico Lake Turquoise is beautiful, rare and in high demand. 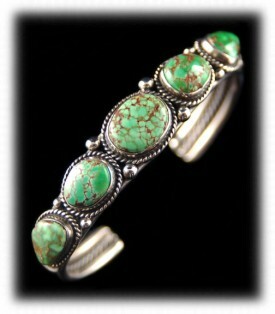 A Carico Lake Turquoise Bracelet is a great piece of Turquoise Jewelry to wear on a daily basis. To the left is a Carico Lake Turquoise Pendant handmade by Navajo Native American artist Vernon Begay. It has a beautiful Victorian design in Sterling Silver with a rich two toned green and blue Carico Lake Turquoise gemstone. This is a very nice piece of collectors Turquoise Jewelry that would be great addition to a Turquoise Jewelry collection. To the right is a beautiful Carico Lake Turquoise gemstone accented with 14k Gold, made by Nattarika Hartman of Durango Silver Company. The Carico Lake Gemstone was cut by John Hartman and was finished on both sides of the stone. Nattarika designed this pendant with an open back so you can see the entire stone. The Lost wax style of work is unique and each piece is a one-of-a-kind. 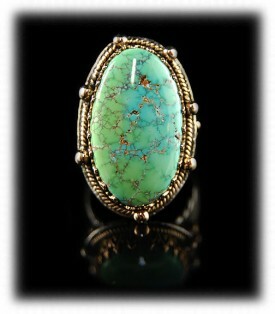 This is a lovely piece that would be a great addition to your Turquoise Jewelry Collection as well. To the left is a beautiful ladies dinner ring made with a combination of gemstones including Carico Lake Turquoise, Sleeping Beauty Turquoise and Sugilite. 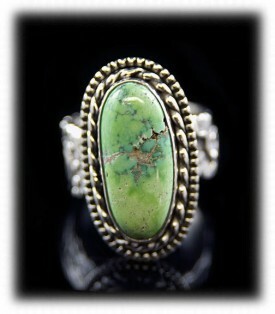 This Turquoise Ring was handcrafted by John Hartman of Durango Silver Company. John began creating this ring by cutting each of the gemstones and then fabricating the Sterling Silver to enhance this beautiful set of gemstones. To the right is a great pair of Carico Lake Turquoise Earrings made by Navajo Native American artist Archie Ganadonegro. 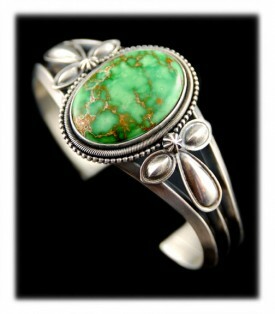 They feature beautiful rich Nevada green Carico Lake Turquoise stones that are magnificent. 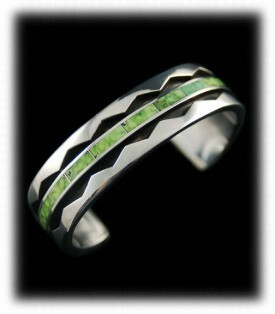 The Silver work is classic Navajo design and are very attractive when worn. 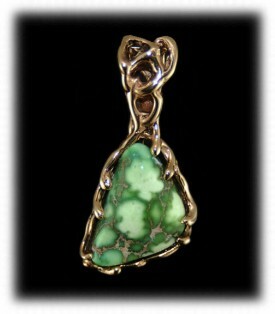 Green Turquoise matches most any dress color and can easily be worn often and with any assemble. To the left is a very nice Carico Lake Turquoise Ring with a beautiful spring green Carico Lake Turquoise gemstone as its focal point. The Silver work was created by John Hartman and it can be seen on its presentation page within the Durango Silver Company website. The ring shake is unique as it has rock art designs in hammered Silver. Check it out! To the upper right is a bubbly water web Lime Green Carico Lake Turquoise Ring for women by Native American Navajo artisan Ben Chavez. 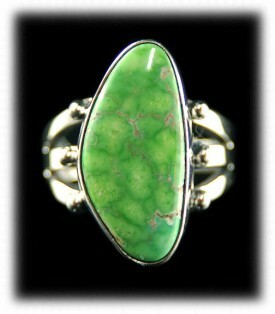 This is a great ring that focuses on a wonderful lime green Carico Lake Turquoise gemstone. This lime Turquoise stone has what is called water webbing which is very attractive as well as being collectible. To the left is a Carico Lake Turquoise Pendant made in a Victorian style of Silver work by John Hartman of Durango Silver Company. 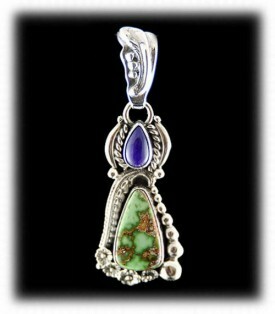 This piece also has a Sugilite stone that accents the Turquoise nicely. You can see this pendant as well as many other pieces of Carico Lake Turquoise Jewelry by typing in "Carico Lake Turquoise" in the search box to the upper left hand side of this page. To the right is a Carico Lake Turquoise Link Bracelet created in 14k gold by Native American artist Will Denetdale. This would be the perfect everyday bracelet for the gold and Turquoise jewelry lover. This Carico Lake Turquoise tennis bracelet features seven sold 14k gold links the feature a freeform cut, natural lime green Turquoise cabochon from the Carico Lake Turquoise mine in Nevada, USA. The seven lime Turquoise cabochons are top gem grade. Each stone is bezel set and surrounded with a heavy saw work design. All seven 14k gold and Turquoise links are connected by solid gold chain links. The bracelet is finished off with solid 14k gold chain and a 14k gold toggle clasp. 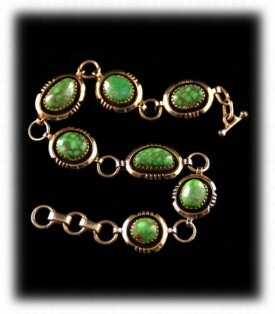 This bracelet would be a fine addition to any Gold Jewelry or Southwestern Jewelry collection. We hope you have gained some useful knowledge from our Carico Lake Turquoise educational presentation page. We invite you to learn more about Silver Jewelry, Indian Jewelry and Turquoise Jewelry by following the links in our Learning Center which has many other informational pages that we have written on topics related to Southwestern Silver Jewelry. In addition, we would like to invite you to join our E-Mail Newsletter - about once every other month we send out a Newsletter to inform our members of what's happening with Durango Silver Company, new products, specials for our members and more. We also have a monthly drawing from our members to Giveaway free Turquoise Jewelry from our company. Please take a moment to become one of our friends and future winners in our giveaway by signing in below.